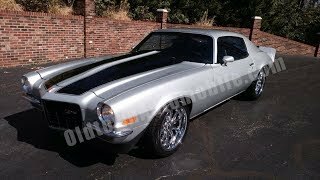 Hi, I am interested in your 1972 Chevrolet Camaro (stock #1781) listed on Autotrader for $34,900. I'd like to get more information about this vehicle and confirm its availability. RECENTLY RESTORED, solid straight rust-free southern body and floors, slick Cortez silver paint, steel 2 cowl hood, 350/350hp engine with Holley carb, and MSD ignition, headers with dual exhaust, Auto Gear M23 4-speed manual transmission with heavy duty clutch, 12 bolt 342 positraction rear, power steering, power disc brakes, Hotchkis front and rear sway bars, 17 and 18 chrome American wheels, all stock interior, bucket seats, Classic Console, rally dash with tach and gauges, tilt wheel, JVC stereo c/d, Hurst Competition Plus shifter, car is in great shape and drives out the way it looks. 50+ photos on our website at www.oldtownautomobile.com.